The problem with Burlington, Vermont is that there are too many sustainable options for dining, lodging, and things to do. Okay, it’s not a problem so much as it is a conundrum, and it may leave you wishing you had more time to explore and experience all that it has to offer. Or perhaps move there. At least it did for me. Everywhere I turned, I found resources for sustainable travel—from the Vermont Fresh Network connecting farmers with chefs around the state, to the Vermont Green Hotel designation. Burlington’s vibe is eclectic-crunchy (the official term) and full of people who are happy to call it home and welcome visitors warmly. I asked several people what their favorite part of living in Vermont was, and they all immediately responded with “the people.” After spending a few days there, I could easily see why. The guide is divided into 3 sections–Lodging, Dining, and Things to Do–along with some resources and tips at the end. As much as I would love to personally visit every one of these locations, time and resources don’t allow me to do so. This guide is a blend of personal recommendations and a curated list based on in-depth research and recommendations from locals. I want it to be clear which is which because I wouldn’t want to recommend something I haven’t had personal experience with, so all of the items marked with an asterisk* are ones that I have visited. If it’s not marked with an asterisk, it’s something that I think is worth including but haven’t visited myself. The info provided here is a starting place for your planning and research—make sure to visit the website or call a location to find out about hours, fees, reservations, and other details. ***I was a guest of Burlington Edible History on this tour. I talked with other tour participants and took into consideration the rave reviews they had to offer as well as my own experience. I was not required to give a positive review, and all opinions expressed are my own. First things first—you probably need to figure out where to stay in Burlington before making a lot of other plans (unless you’re the adventurous type who doesn’t like to plan ahead!). Burlington has quite a few lodging options in various sections and neighboring towns (which are often cheaper but a little less convenient). For the budget conscious or more casual traveler, search the many Airbnb listings* in and around Burlington. (I loved my stay with Holly in her home near downtown!) North Beach Park offers camping, and the Burlington Bike Path passes through it, so getting to downtown is a short bike or car ride away. If you’d like the classic Vermont bed and breakfast experience, take a look at the 254 South Union Guesthouse**. This B&B is in a historic home that is centrally located, and it includes some local food in the continental breakfast. Another beautiful B&B is Made Inn Vermont, which offers a modern, chic take on the classic bed and breakfast. The breakfast at Made Inn Vermont includes a local, seasonal menu. For travelers who prefer the atmosphere of a hotel, check out Hotel Vermont**, a modern hotel located right in downtown. (Additional daily parking fee.) If you’ve got hotel points from some of the major chains that you want to use, there are several in Burlington that have the Green Hotel designation: Courtyard Marriott Burlington Harbor**, Doubletree by Hilton**, and Sheraton**. Looking for more places to stay in Burlington? Find the best deal, compare prices, and read reviews from other travelers at TripAdvisor. There are plenty of cafés in Burlington, many of them sourcing local and organic ingredients. —Maglianero Café serves up food from local partners (including delicious treats from Jam Bakery*), and ethically-sourced coffee and tea. –Looking for fantastic vegan food? Check out Pingala Café & Eatery for breakfast or lunch. —Speeder & Earl’s is a mainstay in Burlington. 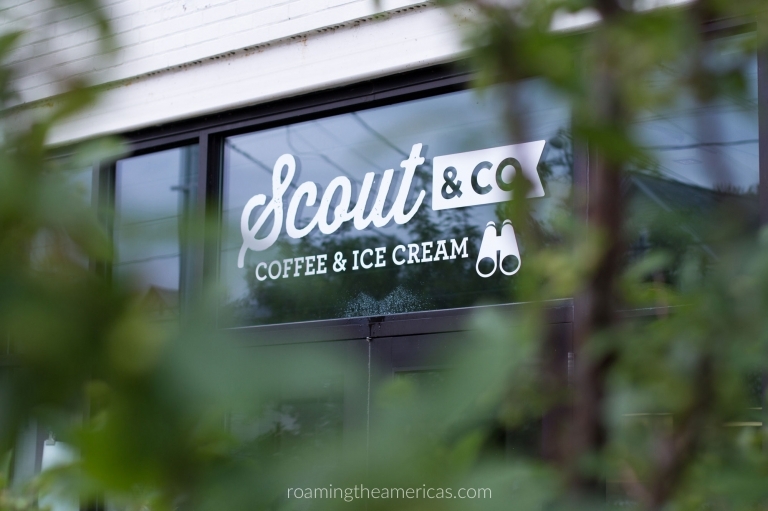 For over 20 years, this family-owned business has been roasting their own coffee and now has two coffee shops in town—the cozy Church Street location (great for in-and-out while shopping) and the more spacious Pine Street location. –Another downtown favorite with a unique atmosphere is Muddy Waters. 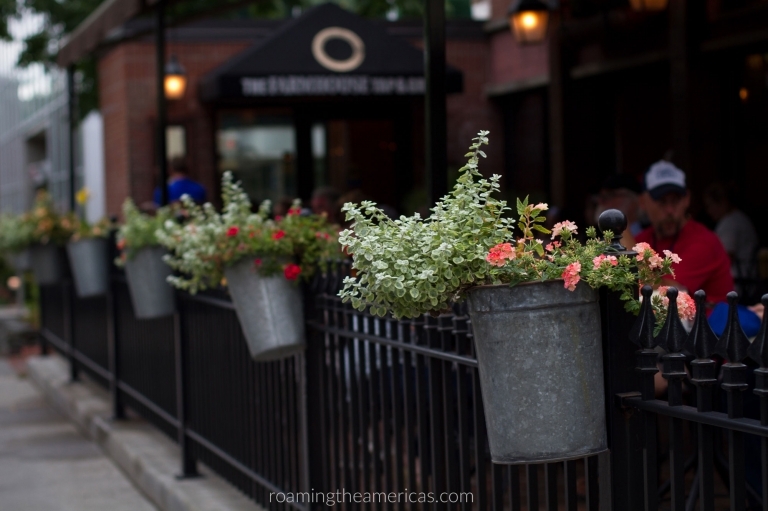 –Two of my favorite spots were located a few minutes outside of downtown. Scout & Co. O.N.E. * has good coffee, and the atmosphere is bright and spacious—the kind of place I’d be energized to get some work done. –I had seen Barrio Bakery’s* booth at the Burlington Farmer’s Market and was intrigued by the name, but was distracted by so many others that I didn’t stop in. But when a local recommended it to me, I decided to check out the brick and mortar shop they have. The coffee was easily my favorite, and I had a hard time choosing which fresh pastry to try. With a small and cozy atmosphere, Barrio Bakery is a great spot to chat with a friend or just enjoy a good book with excellent coffee. As soon as I read about the Skinny Pancake*, I knew it was a must for my itinerary. A crepe restaurant with local food woven into the fabric of their food philosophy? Yes, please. The Skinny Pancake offers sweet and savory crepes, as well as some non-crepe fare like burgers and fries. They’re open late, and there’s usually a line out the door, but it moves quickly. Check out their sister restaurant, The Chubby Muffin, which serves breakfast, lunch, and snacks until late afternoon. After several people raved about the breakfast at Penny Cluse*, and after hearing about how packed it is every day during breakfast and lunch hours, I had to check it out. Not only was my breakfast special divine (Maple Cornbread French Toast with honeyed ricotta and an order of strawberries on top), the service was excellent and the atmosphere was just as a breakfast place should be—warm and inviting with the energetic buzz of locals and visitors savoring their morning. The Red Onion* is a little spot on Church Street that’s not very flashy, but it’s the smell that you won’t be able to turn away from—freshly baked bread is their specialty. A great place to grab a sandwich for a picnic lunch! Another good place to grab-and-go is the City Market Onion River Co-op*. Get some groceries for a simple breakfast (I picked some wild blackberries while hiking, so I stopped here to get Vermont yogurt and granola), or stop by the food bar or sandwich shop to pick up some prepared food. The Farmhouse Tap & Grill* is a fantastic spot downtown to get excellent farm-to-table food along with wine, cocktails, and tons of craft beer options. It’s super crowded, but everything moves at a good pace—you can tell it’s the norm for them. Looking for an upscale vegetarian option? Revolution Kitchen has you covered with a menu that changes daily to bring you the freshest ingredients! For something a little more casual, stop into El Cortijo* for tacos made with local ingredients served up inside a historic 1950s diner. It’s small with a funky vibe, but it doesn’t feel overly crowded. If you’re strolling the Church Street Marketplace and would rather grab something on the go, there are several food carts you’ll come across, including the Skinny Pancake*—a great option for those nights that you want something simple or don’t have time to sit down somewhere. American Flatbread Burlington Hearth* is a great spot for brick oven pizza–they’ve even got their own craft brewery. The dining room has an inviting atmosphere, and if you’re there during warmer months, you can enjoy the gorgeous outdoor dining space in a large alley between brick buildings. Looking for more restaurants in Burlington? Find the best deal, compare prices, and read reviews from other travelers at TripAdvisor. You’ll hear a lot about the sunset over the lake in Burlington, but finding a great spot that’s not obstructed by trees or buildings can be a challenge. Waterfront Park* is nice, but depending on what else is going on, it may be crowded with parking hard to find. Battery Park* overlooks Waterfront Park and is a bit less crowded. For a different view of the lake, rent a kayak from the Community Sailing Center*. TIPS: For the best light for photos, go out as late as possible before they close—starting your hour rental between 6:00-6:45 in the summer. You might not quite catch the sunset (depending on when in the summer it is), but the light will be softer than it is in the middle of the day. I probably don’t need to tell you this, but be super careful if you take your phone or camera out! My phone is water resistant, and I put it inside my wallet, inside of a plastic zipper bag and very carefully took it out for photos. I was paranoid about it, but I really wanted those photos. Oakledge Park* on the south side of the city was one of my favorite spots. It wasn’t crowded when I went, and it’s just a short walk from the second parking lot to a cove and rocky peninsula that makes a great viewing spot. Or find your way through the woods to a cliff overlooking the water (follow the voices of teenagers who are up there to cliff jump). TIP: Head to Oakledge on a Sunday night after 6 PM, and you won’t have to pay for parking. Another stunning place to head in the late afternoon or early evening is Mt. Philo State Park*. You can drive or hike up the small mountain, and enjoy the panoramic views of the Adirondacks and Green Mountains. Relax in an Adirondack chair and read a book as the sun sets, or bring a picnic or food to grill and enjoy dinner with one of the best views around. Looking for a quiet walk in the woods with some scenic overlooks of the lake? The Rock Point Center is private property (just north of North Beach Park) owned by the Episcopal Church in Vermont, but the trails are open to the public as long as you register at the office or online. Pick up a trail map at the office and head out to explore. The map and trails aren’t extremely well marked or easy to follow, but keep an eye out for landmarks on the map and you should find your way around. TIP: If it’s blackberry season (August), look for a sprawling patch where Beaver Pond Walk meets Bishops House Walk—bring a container or bag because you’ll want more than what fits in your hand (or mouth)! The one outdoor activity you must do in Burlington is the bike path* along Lake Champlain. This was the highlight of my trip–I loved it so much I went out riding twice. Rent a bike from the folks at Local Motion if you don’t have your own, and make sure you pick up one of their helpful trail maps while you’re there. TIPS: I highly recommend getting out all the way to the Colchester Causeway if you want a 360 degree view of the lake and mountains. Depending on how far you want to bike and whether you have a way to transport your bike, you can start from various locations along the path. I started at Leddy Park the first time for a 10 mile ride and Airport Park in Colchester the second time for a shorter 6 mile ride onto the causeway. If want to see the rest of the city this way, check out the self-guided Cycle the City tour to explore the culture, history, and points of interest on two wheels. Local Motion’s guide and map are available online. The small-town, farming culture in Vermont is deeply rooted and has maintained its relevance even in today’s world of mass production and factory farming. So you really can’t go to Vermont without visiting a local farm. Pick your own organic berries at Adams Berry Farm in Charlotte. Head to burger night at Bread and Butter Farm (every Friday from May-September) for live music and a truly farm-to-table experience, or find their pop-up cafe for coffee and baked goods. Or head to Shelburne Farms* to walk around the stunning grounds, watch the cheese making process in action, or take a wagon tour of the property (small additional fee) to learn more about the rich history, current educational projects, and conservation efforts of this gorgeous farm on Lake Champlain. TIP: Even though there are lots of activities that make Shelburne Farms fun for kids (education is a big part of their mission), it’s a great place for couples, friends, or for the independent types like myself, a solo adventure. Take a property tour and find out why our tour guide, Steve, said this used to be “the Downton Abbey of the United States.” The staff is outstanding and will be happy to answer any questions or give you suggestions on where to go. At the very least, connect with local farms, artists, and community organizations at the weekly Burlington Farmers Market*. It’s a fun way to spend a Saturday morning, people watching while you meander from booth to booth. Another highlight of my trip was the Burlington Edible History Tour***. This fascinating food tour brings together learning, farm-to-table food, and multicultural history. It’s anything but a boring history lecture, and it combines research, passion, and interesting storytelling to give a rich picture of Burlington’s food traditions. Plus, they donate 10% of profits to the New Farms for New Americans project, which provides affordable farm land to refugees so they can stay connected to their own culinary traditions and crops. Check out my full post here. Going to be in Burlington on a Friday night in the summer? Make sure you check out the Arts Riot Truck Stop* to sample lots of local food trucks, enjoy hanging out with friends in a relaxed outdoor atmosphere, and listen to live music. Trinket* and Vintage Inspired are two boutique shops with unique products, and both include some local makers and artists. Step inside Frog Hollow’s beautiful gallery and marketplace* on Church Street, which features the work of Vermont artists and craftspeople. Browse the shelves at a couple of local, independent bookstores in downtown Burlington—Crow Bookshop* and Phoenix Books*. Need clothes or other supplies for all the outdoor adventures you’re having in Burlington? Head to Outdoor Gear Exchange, a huge consignment store for outdoor gear. They strive to make outdoor adventure affordable for everyone and have a commitment to environmental stewardship in their business. Looking for more things to do in Burlington? Find the best deal, compare prices, and read reviews from other travelers at TripAdvisor. I’m a big fan of not just researching things to do and places to eat, but getting to know more about a location’s history and culture (Read: 3 Reasons Everyone Should Learn History Before Traveling). One great way to do that is to read some books before and as you travel. Below are various recommendations for the practical research as well as books about Vermont life or set in Vermont. —Moon Vermont* and Fodor’s New England* gave me some good ideas to get started with exploring Burlington and the area. —Seven Days VT* (both a website and local paper available around town) is a great resource for events happening in Burlington. This is how I found the Burlington Edible History Tour, and I’m so glad I stumbled across it! —Edible Green Mountains* and Vermont Fresh Network* have printed resources you can pick up at the City Market if you want to dig deeper into farm-to-table options and information. —Mud Season and the follow-up Good Grief by Ellen Stimson chronicle her journey of moving to Vermont and settling into rural life there. –Cars stop for pedestrians like they’ve got nowhere to be, ever. Really, they take the yielding to pedestrians law seriously. So be aware of this if you’re driving through town! –There are several garages downtown where you get 2 hours of parking free (Marketplace Garage, College St. Garage, and Lakeview Garage). –There’s free parking downtown on Sundays. Like this guide? Click here to bookmark it on Pinterest! Feel free to open up this Google My Map and make a copy into your own Google account. Access it on the web or via the My Maps app (Android app | iPhone app), and you can make your own notes and itinerary in your copy! Wondering how to use Google My Maps? Check out my ultimate guide to using Google My Maps as a trip planner for more info! Each responsible travel guide is an in-depth resource that includes dining, lodging, and things to do in a particular city or region. All while embracing the philosophy of responsible travel–a mindset of traveling to connect, learn, and share experiences across cultures, and seeking to minimize our negative impact on the local culture, economy, and environment.